Self-portrait. I used soft focus, and normal contrast at an shq setting. Exposure compensated by -0.5. Taken with natural light from a window to the left to obtain classic Renbrandt lighting. Post processing included dodging around the neck and bodice, colorizing around the eye and cheek, and using many layers to adjust brightness, contrast and hue and saturation. Also added a soft blur effect to soften skin, and used airbrushing to remove wrinkles. Increased sharpness around eyes and earring with spot sharpening. Let me start out by saying that I'd probably have given this an 8 or a 9. I'm a sucker for the painting and I quite like this particular one. Yes, the focus was indeed the issue here, but the star of the show is the lighting. Beautifully lit. Really nicely done there. Your pose is brilliant as well. So on the photography level, you've nailed it 100%. The problems come in in your PP choices. painting is indeed more contrasty in the face (especially in the eyes, which almost look like Vermeer over-used the 'dodge' tool), but is not 'sharp'. So it seems like the soft focus was an attempt to replicate those ideas. If there had been some grain added, a very subtle amount of craqueling and posterization feel underneath the soft focus layer and a small amount of contrast boost in the eyes, I feel that this would have come together a bit better. Another thing that I don't like is the black. It's common in photos to have pure blacks. But it's not common at all in painting to have pure blacks. 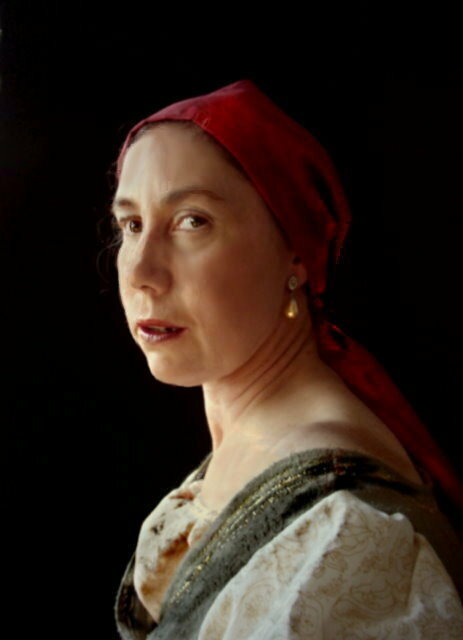 In Vermeer's, his background is a dark brownish and serves to increase the "pop" of the blue headband just a bit. Your headband is red, so it wouldn't pop as well off a dark brownish, but I don't think it's necessary. This picture doesn't necessarily need to be MORE contrasty than the original, especially given the context of an older subject. Of course it's a recreation of "The Girl with the Pearl Earring"
But you have titled it "The Lady with the Pearl Earring"
because it's a picture of the girl all grown up but who kept her pearl earring all those years! This is one amazingly good image. Apparently there's a very fine line between soft-focus and out-of-focus. You probably would have received fewer out-of-focus comments if you had left more sharpness around the eyes. I like the processing on this one up until the soft focus was applied. I like the other one because it's a smidge sharper. This is a good reproduction of an old painting. Hope you have continued with the idea. I'm sorry they didn't see it, I still just love this, and think it's one of the best photos in your portfolio. Don't let the luke-warm reception here put you off of working with this technique. I would be proud to have something like this in my portfolio! I'm looking forward to seeing more of your work in the future. I recently saw that movie. This is a very skillful interpretation of that portrait. Lovely, and quite risky using a model who isn't 16 and drop dead gorgeous, it still works. I like this a lot. I just wish a little more sharpness in her eyes. Nice effort in the interpretation but shows up like a cheap copy tho' plus it's a little blur. And a good interpretation, too. The lighting is especially good, and I like the deliberate softness; makes your tribute all the more 'authentic'. 7. Unique interpretation. Very nice orginal thought. A little OOF but otherwise a good version of a famous painting. does the painting look a little blurry also? other than that I like it. This seems like a good start, but your model appears out of focus and her lips look as though she was speaking. beautiful. The lighting and the model capture the true emotions of the paiting. Lovely work. What a nice idea, nice lighting but a little too soft..
Good interpretation. Not real sure about the fuzzyness however it does give that older appearance. focus appears to be a little soft to me. Vermeerish without question but too soft. I apologize for not recognizing the painting. My one critique of this interpretation of it would be the use of shallow DOF. I think shallow DOF can work very well in a portrait. But I believe you generally want the near eye to be the one in focus, rather than the far eye (in this case, her right eye appears to be more in focus than her left). I like the concept, and a bit more focus this would have done really well (for me). I would like to see her face more in focus. Nice job recreating the painting. Nice representation. Would like to see it a little sharper, however. I like your concept and your lighting, but the focus is just not sharp enough. Well, she certainly grew up! I think it needs a bit of sharpening but great idea for your portrait. Beautifl pose and idea but out of focus. this image is needs to be sharper...did you use a tripod for this shot? Good portrait, this just seems a tad out of focus. Interesting and imaginative. I like the coloration and the take on the classic. Hard to tell if you were trying for soft look or it's just a little out of focus. Nice model adn great pose. Proudly hosted by Sargasso Networks. Current Server Time: 04/18/2019 12:21:12 PM EDT.